On Aug 15, 1995 the Zetas went on record stating that our Sun has a binary, and that Planet X orbits both on a long eliptical orbit essentially a sling orbit. On Oct 15, 1995 they gave more detail about this dark binary, which has never lit. The path of Planet X is elliptical, making a long flat circle around its two gravitational masters, your Sun and a body you cannot see. Since it rivals the Sun in mass, the assumption would be that your astronomers would know about it. However, being dark, they stare past it and think it space. 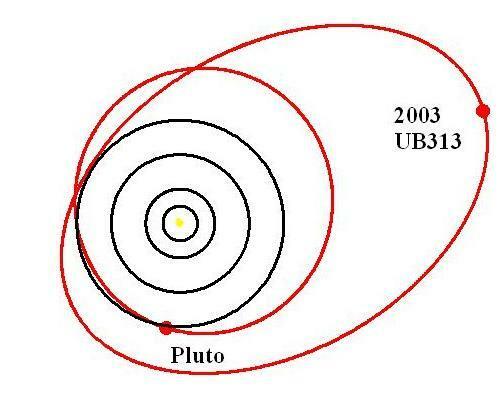 To use multiples of the distance from your Sun to its farthest known orbiting planet, which you call Pluto, this foci is from the Sun 18.724 times as far away. This second foci of Planet X has not been located by your astronomers because it is dark, not lit, and does not happen to block any view your astronomers are particularly interested in. They think it empty space. Unlike the Sun, this dark twin never lit. Although comparable in size and mass, its composition was subtly different, and it has no potential for becoming a lit sun under the present conditions in your part of the Universe. It has no planets of any size to mention, though is orbited by a lot of trash. Should one wish to search for it, it stands at an angle of 11 degrees off the Earth's orbital plane around the Sun, in the same direction we have given for the approach of Planet X. Not being a luminous body, and not giving off any radiation detectable by human devices, you will be unable to locate it, but this does not mean that it is not there. On Apr 24, 2006 scientists were coming forward declaring that our Sun was indeed part of a binary twin set, based on the orbits of newly discovered planetoids Sedna and Xena. Note, like the outer planets of the solar system and 13 long period comets, these long eliptical orbits lean in the direction of Orion, where the Zetas state the dark binary twin sun lies. The Binary Research Institute (BRI) has found that orbital characteristics of the recently discovered planetoid, "Sedna", demonstrate the possibility that our sun might be part of a binary star system. A binary star system consists of two stars gravitationally bound orbiting a common center of mass. Once thought to be highly unusual, such systems are now considered to be common in the Milky Way galaxy. Walter Cruttenden at BRI, Professor Richard Muller at UC Berkeley, Dr. Daniel Whitmire of the University of Louisiana, amongst several others, have long speculated on the possibility that our sun might have an as yet undiscovered companion. Most of the evidence has been statistical rather than physical. The recent discovery of Sedna, a small planet like object first detected by Cal Tech astronomer Dr. Michael Brown, provides what could be indirect physical evidence of a solar companion. Matching the recent findings by Dr. Brown, showing that Sedna moves in a highly unusual elliptical orbit, Cruttenden has determined that Sedna moves in resonance with previously published orbital data for a hypothetical companion star. In the May 2006 issue of Discover, Dr. Brown stated: "Sedna shouldn't be there. There's no way to put Sedna where it is. It never comes close enough to be affected by the sun, but it never goes far enough away from the sun to be affected by other stars... Sedna is stuck, frozen in place; there's no way to move it, basically there's no way to put it there - unless it formed there. But it's in a very elliptical orbit like that. It simply can't be there. There's no possible way - except it is. So how, then?" "I'm thinking it was placed there in the earliest history of the solar system. I'm thinking it could have gotten there if there used to be stars a lot closer than they are now and those stars affected Sedna on the outer part of its orbit and then later on moved away. So I call Sedna a fossil record of the earliest solar system. Eventually, when other fossil records are found, Sedna will help tell us how the sun formed and the number of stars that were close to the sun when it formed." With Dr. Brown's recent discoveries of Sedna and Xena, (now confirmed to be larger than Pluto), the search for a companion star may be gaining momentum. On 15 March 2004, astronomers from Caltech, Gemini Observatory, and Yale University announced the discovery of the coldest, most distant object known to orbit the sun. The object was found at a distance 90 times greater than that from the sun to the earth -- about 3 times further than Pluto, the most distant known planet. Standing on the surface of Sedna, you could block the entire sun with the head of a pin held at arm's length. Even more interestingly, the orbit of Sedna is extreme elliptical, in contrast to all of the much closer planets, and it takes 10,500 years to circle the sun. In March 2004, the location of Sedna is easily found in the evening sky to the southwest just after sunset. It is almost directly below Mars, and forms a triangle with the very bright Venus. The following sky chart was accurate for mid-March 2004 and is only left in place for an historical reference. The new planet is the most distant object ever seen in orbit around the sun, even more distant than Sedna, the planetoid discovered almost 2 years ago. It is almost 10 billion miles from the sun and more than 3 times more distant than the next closest planet, Pluto and takes more than twice as long to orbit the sun as Pluto.